3-room apartment 60 m2. Partly with sloping ceilings, simple and comfortable furnishings: living/sleeping room with 1 double sofabed and digital TV. 1 room with 1 french bed. 1 room with 3 sleeping facilities. Kitchenette (4 hot plates, freezer) with dining table and dining nook. Shower/bidet/WC. Gas heating, boiler. View of the mountains, the valley and the resort. Facilities: Internet (WiFi, free). Maximum 1 pet/ dog allowed. Commezzadura 4 km from Mezzana: Child friendly, beautiful, comfortable residence Palazzina Sole, 2 storeys, surrounded by trees and meadows. 13 apartments in the property. 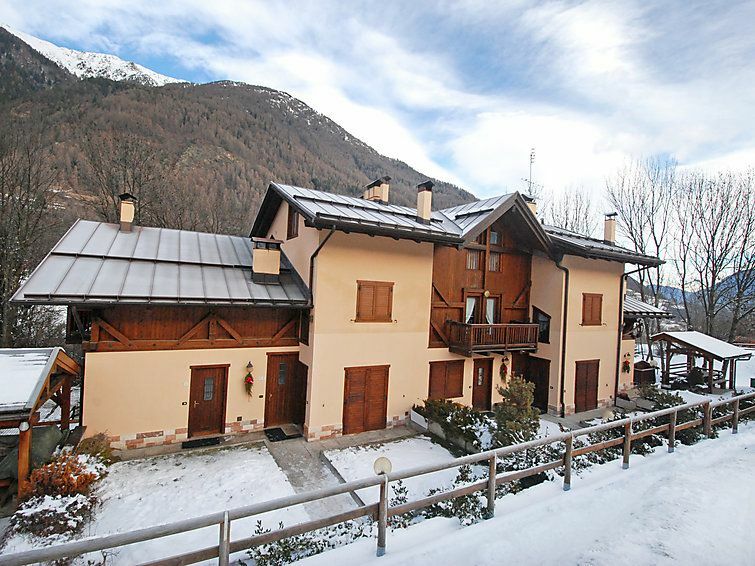 Outside the resort, in a quiet, sunny position, 800 m from the skiing area, located by a road. For shared use: garden, lawn for sunbathing. Tennis, table tennis, barbecue, children's playground. In the house: table tennis, table football, washing machine (for shared use, extra). Roofed, parking (limited number of spaces, extra) at the house, public parking on the road. Shop, grocery, restaurant 500 m, bus stop 100 m. Chair lift, children's ski school 800 m. Please note: the photograph shows a typical example. There are more similar properties for rent in this same residence.